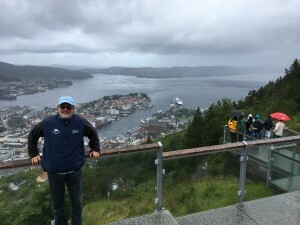 Beautiful Bergen but it IS the wettest city in Europe! A long way from home. 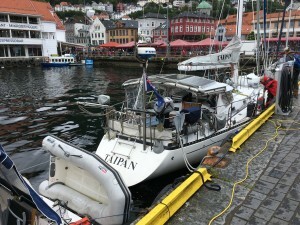 Australian SV Taipan in Bergen. David & Kris are making their way to The Orwell. 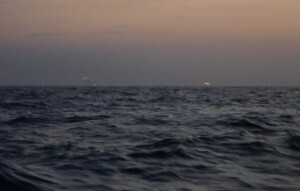 Moving south and towards home. 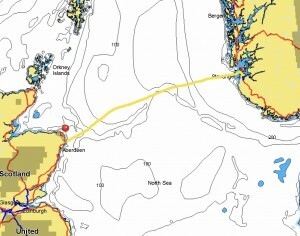 We are in a small anchorage just south of the Marstien entrance from the North Sea. 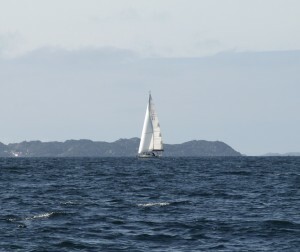 Coming south we crossed the Korsfjorden in quite strong westerly winds passing between Navoya and Stora Kalsoy. With an air draft of 17 metress the 20 metre bridge was always going to look daunting and a mast destroyer. 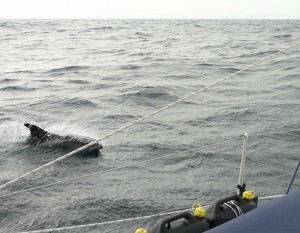 But we are with ‘Hunter Horizon’ and their air draft is a tad higher with a 47’ boat, although not by much. They went first. 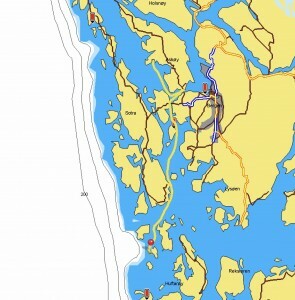 I thought they had gone mad when they turned west and faced the open North Sea again! 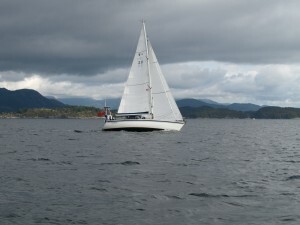 But the anchorage is very sheltered. 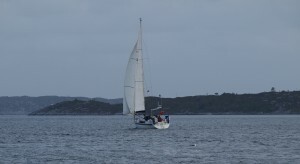 They picked up the one mooring and ‘Talisker 1’ anchored. 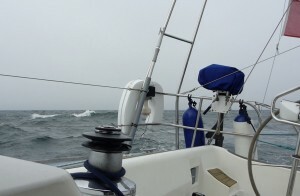 Getting to the anchorage was … brave in the conditions. I nearly pulled out and probably should have done. 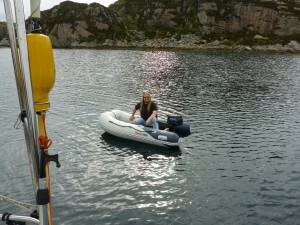 Irene made fabulous roast pork and Geir came and collected me in their inflatable. Being spoilt rotten! 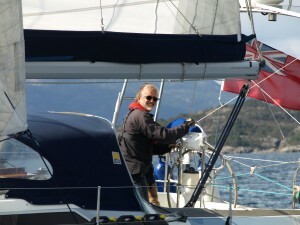 Geir collecting me for supper! 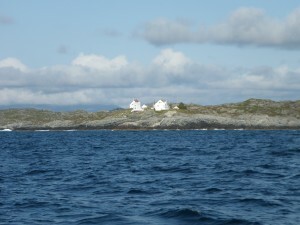 We left Askoy Seilforening early afternoon yesterday and had a cracking sail all the way here…. until the last bit. 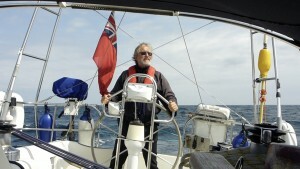 I’m having fun with a funny, kind and generous couple whose sailing rather reminds me of mine in the early days of sailing cruising boats but in their case it’s all totally self taught and read about, rather than mine which has had the benefit of Sea School, Simon Abley, Graham Bush, Philippe Taylor and James Robinson. And in the latter years and of huge importance of course Doc! There was of course reading too. Lots of it!! So they are missing quite a bit. 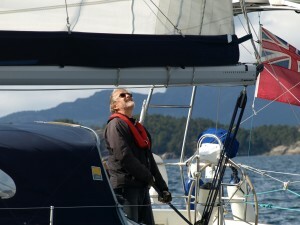 Having sailed nothing else a 47’ boat will teach nothing about sailing. 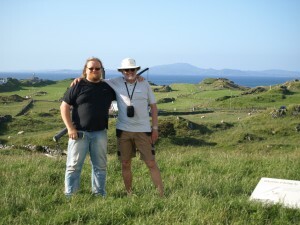 Some tuition by folk who really know is also golden. But finding those golden people is tricky. Particularly, when one is clueless to begin with. It’s not the place to start. 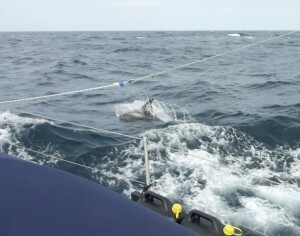 They say they have managed to get caught in the middle of the North Sea in 70 knots of wind !! Survival conditions. 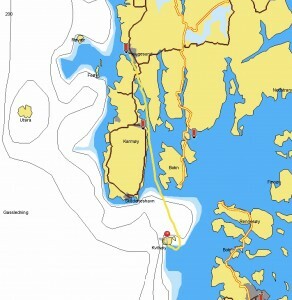 We are now rafted to Geir and Irene and their Gib’sea 472 ‘Horizon Hunter’ in the charming natural harbour in the centre of Kvitsoy Island. It’s rather special Kvitsoy. I missed it last year. 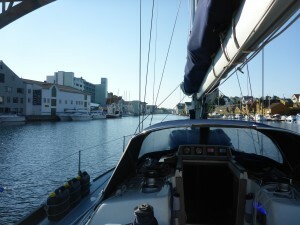 We stopped in Haugesund last night and both boats were rafted to a Polish chap with a Japanese wife and two children with a British registered brand new Ovni SV. 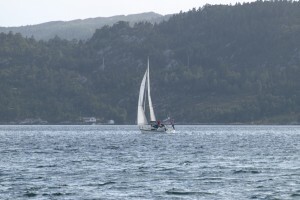 Yesterday we had a great sail in the Bomlafjord. 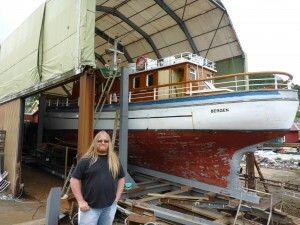 On the way down we stopped in Sagvag for an hour to say hello to my friend Gerhard, at Skips Tomraren Boat Builders. 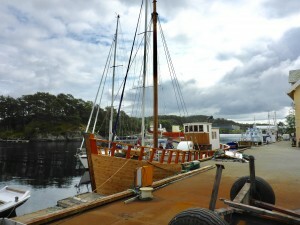 We rafted on Gerhard’s quay to the ship that Gerhard had told me was built in 1790 and the oldest boat in Norway. 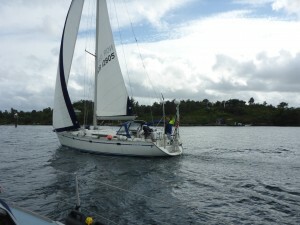 A bit of an exaggeration we discovered as the owner and his partner were on board. 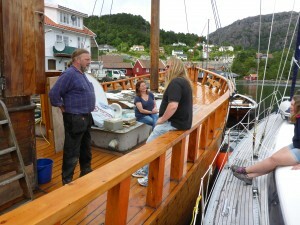 Knut Erik sails the classic Norwegian sailing ship the ‘Loyal’. 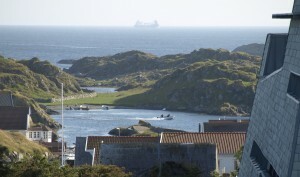 They went to Fair isle on this ship. 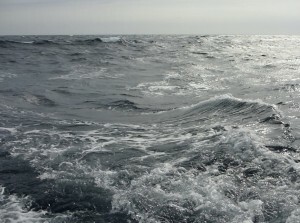 This year they sailed the ‘Loyal’ to Denmark and experienced heavy weather in the Skagerrak. It was a very pleasant hour. She’s acttually 1890’s! 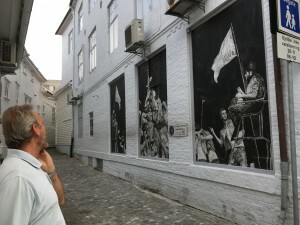 Gerhard had told me in 2016 she was 1790’s! 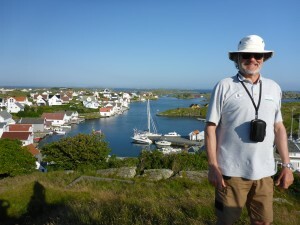 We did not see Gerhard and sailed to Haugesund. 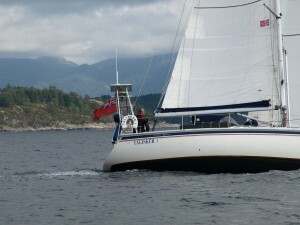 Lots of pictures of ‘Talisker 1’ taken by Irene. Thank you so much. 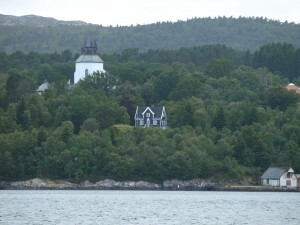 Yesterday we motored the length of the Kamsundet and briefly got close to the island of Bukkoya with its famous church. 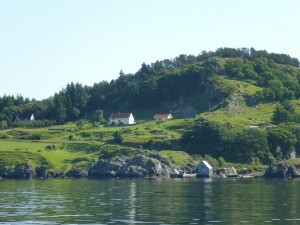 Viking Kings are buried on the island. There is a leaning stone near the church. Legend has it that when the stone eventually leans over far enough to touch the church it will be doomsday. 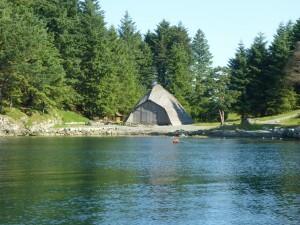 There is a fabulous boat house on the south side of the island that Geir and Irene were keen to show me. 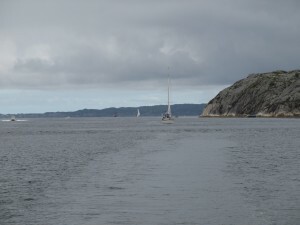 Coming out in to the Boknafjorden there was just enough wind to sail the short distance to Kvitsoy. 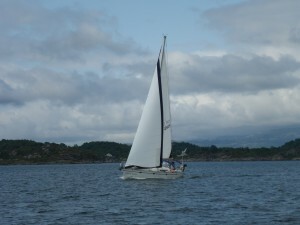 Today we part company with ‘Horizon Hunter’ and sail the short distance to Stavanger. I have had a really great time with them. Not before Irene cooked another special. A fantastic one pan gammon dish. I have to leave them! I will have the strength and size of Obelix if Irene continues to feed me! 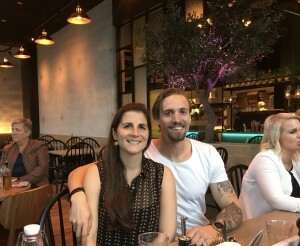 Lovely people and new friends. 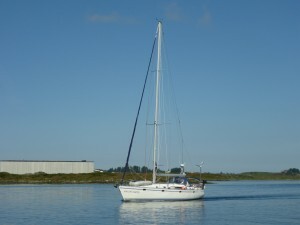 Tonight will be the second night in Peterhead Bay Marina. 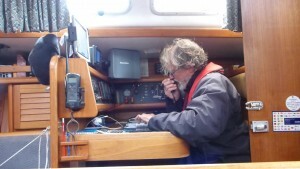 We arrived last night after the longest trip I’ve done with ‘Talisker 1’ and really the voyage was the first time I’ve felt in tune sailing since the near disaster off Felixstowe just before we left Suffolk in early June. I shall write more about my demons later. 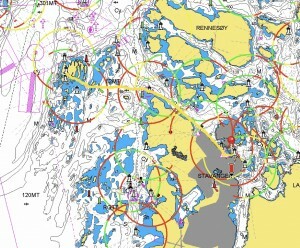 Thanks to Geir downloading zyGrib on to my computer I have another way of checking weather together with all the other sources I use for weather information. Certainly it worked well for this trip. 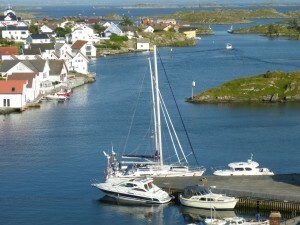 We left Stavanger Seilforening at 2300 BST on Friday and arrived Peterhead Bay Marina engine off last night, Sunday, at 2030 BST. We would have been berthed 40 minutes earlier if we had not run aground at LW Springs in the Peterhead Bay Marina entrance! 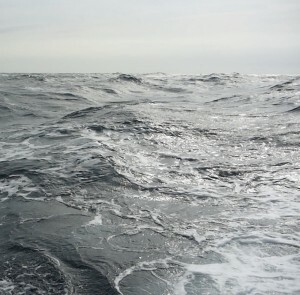 Quite strange having been at sea for so long. Just to sit there. For those who want to know, there is not much water in the entrance at LWS. 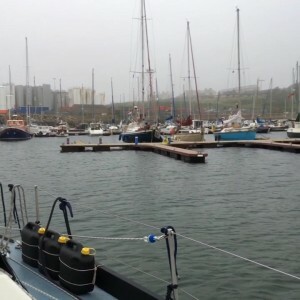 40 minutes in the entrance to Peterhead Bay Marina hard in the sand & mud! 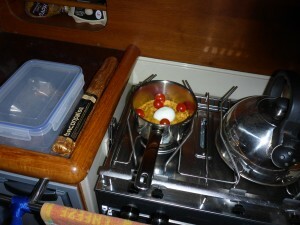 A nice Dutch couple were concerned and came out into the cold and damp conditions with various suggestions. 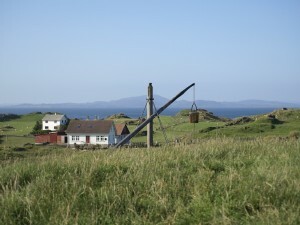 Get some weight on the boom …. 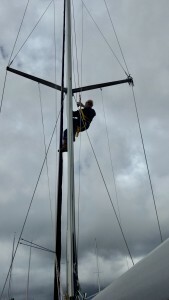 Put some sail up. I’m on my own? I told them. 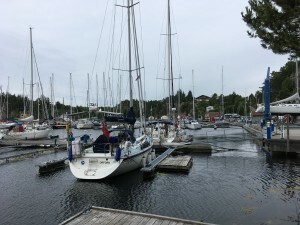 Eventually by helming hard to starboard and then hard to port repeatedly which swung the bow to port and starboard we managed to burrow through the soft sand / mud and get on to the nearest finger in the marina, stern facing the weather and the marina entrance. 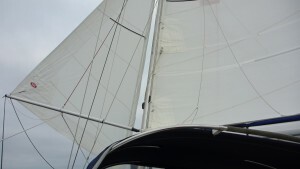 The nice Dutch couple waited and took my lines, which was rather ruined by a nice helpful Englishman who shouted incomprehensibly from the bow. I made the Dutch laugh by remarking that I didn’t do shouting. I hope I did not send the chap up too much. 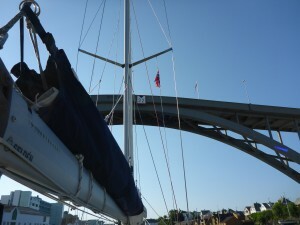 Later, with some more water, we moved in to the marina, bow to the weather, and became the Englishman’s neighbour and we chatted. So I can’t have upset him too much. He owns a Macwester. 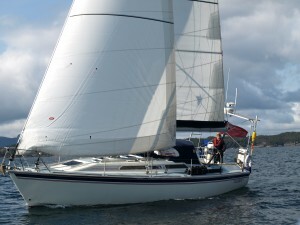 A small solid ketch. 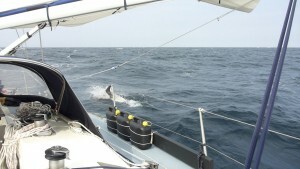 I really enjoyed the sail across the North Sea. 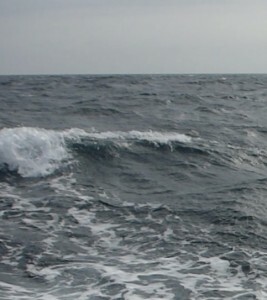 For the most part it was downwind in an easterly 5, occasionally 6, that backed to a northerly 5 to 6 for the last few hours in to Peterhead. 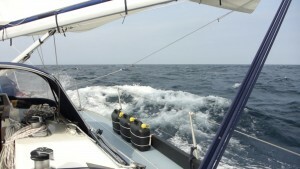 We logged 250 nautical miles in 44 hours. 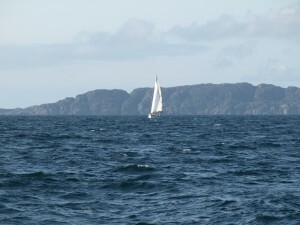 Over the ground the distance is 265 nautical miles. 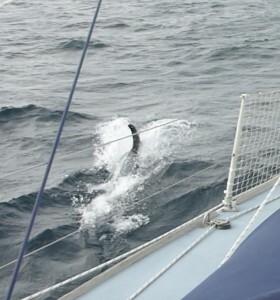 I managed myself and therefore the boat pretty well. Knowing that my radar and AIS alarms work very well, and having that confidence, I was able to have short naps and not be on tenterhooks. Sleeping and waking very often with timers to check around and then sleep again worked very well. 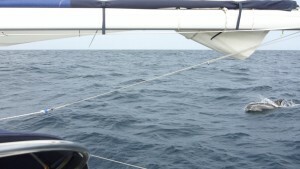 I only put my head down if there were no targets for 35 NM in all directions. As well as collision warnings I also set a guard area around the boat. I slept a lot. 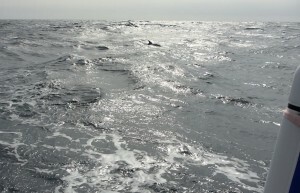 Early on Sunday morning with a following sea and stronger winds and ‘Talisker 1’ handling the conditions beautifully we had a visit from black and white Dolphins … I will never cease to be awed by these fabulous creatures. Their evolution has been perfect. They could not be better designed by our maker. 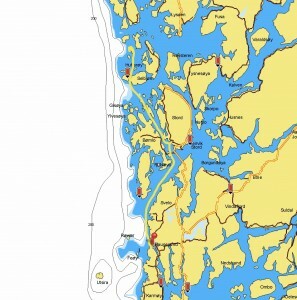 Reporting to Aberdeen CG having filed a passage plan. 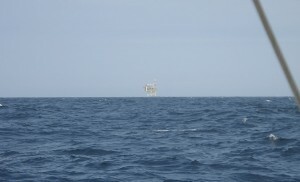 We are 30 NM from Peterhead. About 5 hours. 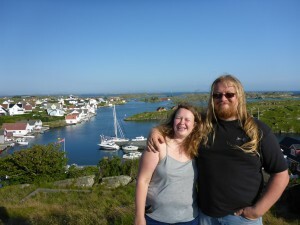 On Thursday I said goodbye to Geir and Irene. 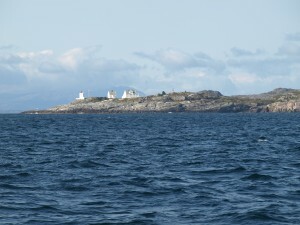 We had walked up to the Kvitsoy lighthouse the night before and looked over the island and out to the North Sea. It’s a special place to stop. 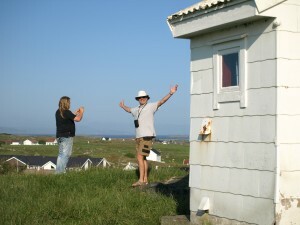 Geir and Irene were waiting for a window to head round the south coast and beyond Mandal. I’ve really enjoyed their company. 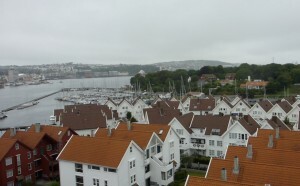 We arrived in Stavanger at 1400 BST and had a lovely afternoon and evening with Svein Erik and Ingeleiv. 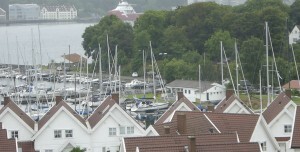 The Stavanger food festival was in full swing. It was wonderful seeing my friends again. 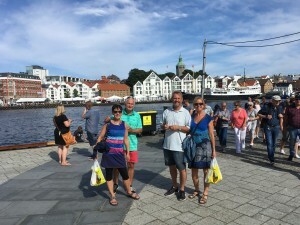 They were with a couple, Egil and Torill, who I had met, with them, in London, 25 years ago. 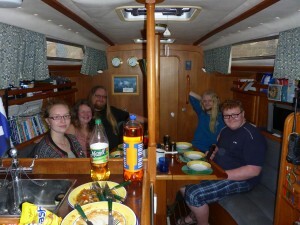 In the evening the five of us visited their friends Bob and Cesile. Bob is English. 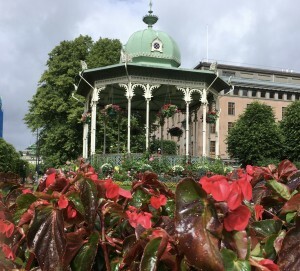 He’s been in Stavanger since he was 21. Bob is older than me! He’s really Norwegian although he still has a home in Yorkshire. 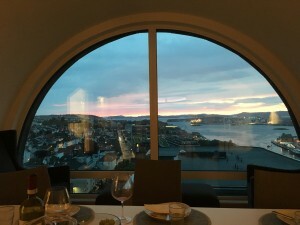 On Friday I was invited to lunch with Ingaleiv and Sven Erik at their fabulous flat overlooking Stavanger’s fjords. 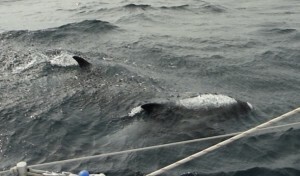 It was lovely to see their eldest, Siri, who had flown in from Trondheim that morning. I last saw Siri when I was 40!! She was a little girl then.. 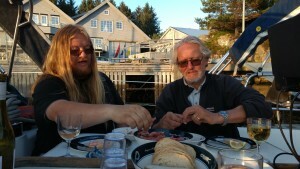 In the evening their boys Vegard and Sondre joined us for supper with Lucila (Luli). 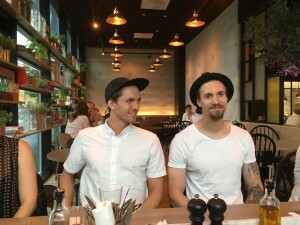 Luli and Vegard are getting married in January. She is from Argentina. 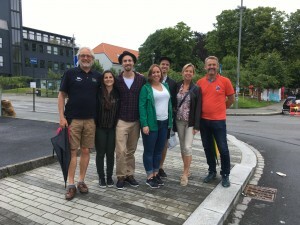 There will be a wedding in Argentina and Norway. Luli brought me a wonderful book on Norway. Lovely. 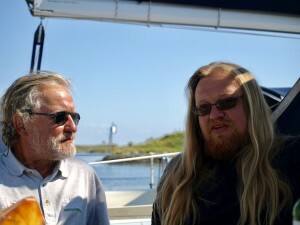 After supper Sven Erik dropped me at the boat and shortly after we were underway for Peterhead. Having not seen these wonderful people for twenty years I’ve caught up with them twice in two years. I slept well in Peterhead last night. 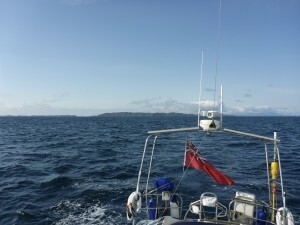 There is little wind tomorrow and then it will be a strong south easterlies for a couple of days so tomorrow we leave for Eyemouth. It will be a long day under engine. 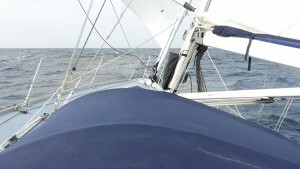 In a couple of days there should be south westerly winds, off the land, which should help to get us further south still. 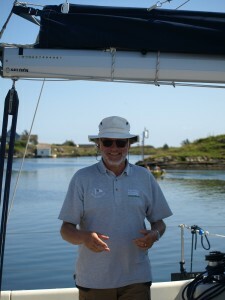 Wonderful Billy, Perterhead Bay Marina HM, was on duty today. A really good man! 17 years he served on the Peterhead RNLI crew! 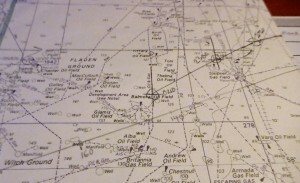 I showed him Reeds, which has completely inaccurate information on Peterhead Bay Marina. And in case I have not said it before. The facilities, showers, laundry room are immaculate. Always do your laundry in Peterhead! !